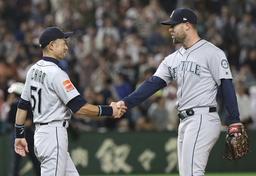 TOKYO (AP) The magnitude of the moment - of sharing the field with the towering Ichiro Suzuki in his farewell - left Seattle Mariners teammate Yusei Kikuchi in reverential silence. Ichiro's teammates met him outside the dugout for a proper send-off in a three-minute tribute. Kikuchi, who worked into the fifth inning, bowed to Ichiro - the 27-year-old lefty was tearing up as he buried his head into Ichiro's shoulder.